120 Nathaniel eating Fettuccine Alfredo with shrimp and chicken at California Pizza Kitchen. 122 Hubby's medal from his first full marathon. 123 Apple bread with streusel topping. Bread recipe found here. 124 Mongolian Beef; taste very authentic! Recipe found here. 125 Disinfecting Nathaniel's toys with water, vinegar, and dish soap. Nathaniel has been battling a fever since Sunday evening and his fever went as high as 105.5F last Wednesday. His pediatrician said it is just a really bad virus so we deep cleaned the house. 126 Still very sick but I love how silly Nathaniel can still be. He also looks very skinny and probably loosing weight too due to poor appetite for being sick since Sunday evening. Really hoping he gets better soon! Great shots. 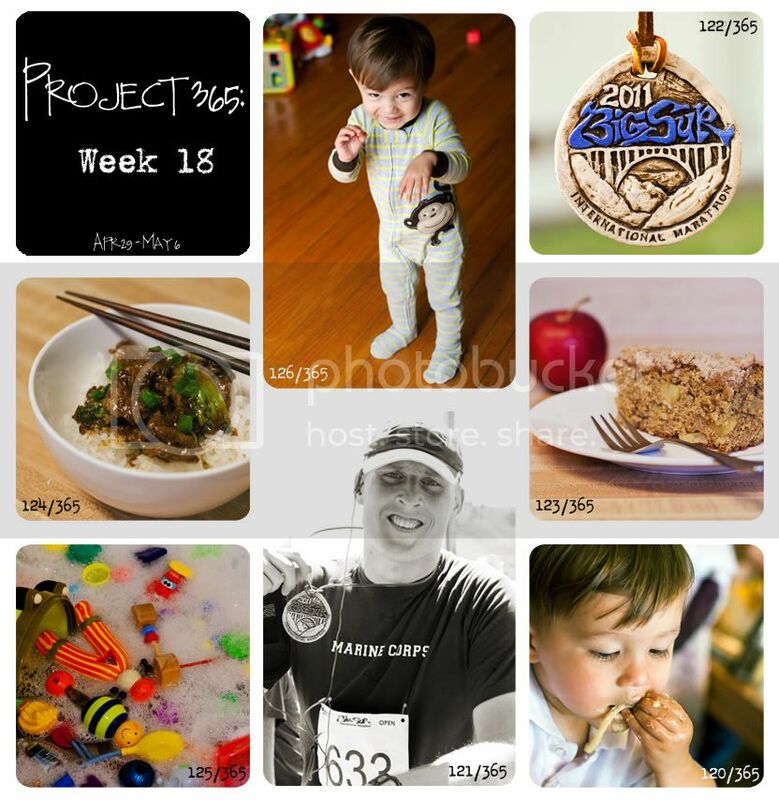 I'm also impressed by everyone who can keep up with their 365 projects. Can't wait to try that Mongolian Beef recipe. It's Tim's favorite. When you're not busy, waaaaay later, can you send me the ratio of water/vinegar/dish soap you use to clean the toys (and is that white vinegar)? Poor kiddo. I've continued praying for him. Hang in there mama buddy. Love your collection of photos this week! I'm impresses- a full marathon and the mongolian beef looks so good. Love day 126 too...so cute! Great snapshots! Love day 120, really cute! Have a great day! All that food looks really good. And the toy bubble bath looks fun even if it wasn't for a fun reason. Wonderful photos! How awesome that your husband ran a marathon and got a medal! Hope your little guy is feeling better! Congrats to your hubby. I love day 126. I hope he feels better. Great photos. Love 126. So adorable! Thanks for linking up. Have a great weekend. Happy Mother's Day. That Mongolian Beef looks soooooooooooo delicious! I will have to try that! Congrats to your hubby that is wonderful news! :) Great picture of the toys being disinfected. I need to do that more often around here! So glad you linked up this week. :) Thanks! !